Even if breaking one hour in the IRONMAN swim is too lofty of a swim goal for you, many of the rules for improving your IRONMAN swim will still apply. Some of the pacing will need to be tweaked a little, but once you reach any swim over 2.4-miles in length, even tiny improvements will yield impressive time savings. What is a sub-hour IRONMAN swim pace? Once I began looking at the pacing that took place during many of my own practices, I realized that most people can swim the necessary pace to break one hour in an IRONMAN swim. Unfortunately, due to the efforts needed and the drag created it is often not sustainable for more than a few lengths. When I use the word “effort” this is more a description of all the components needed to achieve a 1.05-meters-per-second swim speed. Physical exertion should not really be one of these components if your swim stroke is to be sustainable for 60 minutes. Most swimmers that come to me can swim 25 meters in between 24 and 26 seconds. If we could continue this approximate 1-meter-per-second speed, that would put the athlete at about a 63-minute IRONMAN swim, a time I think most athletes would be happy with. Proper technique and a streamlined position are key to allowing you to maintain 25 second per 25 meters (which works out to a 1:40 100-meter pace). Add a wetsuit, some drafting, swimming straight and good sighting and a sub-hour IRONMAN swim becomes possible. If the above added variables are not used correctly, a sub-hour IRONMAN swim becomes much more difficult. Crossover training from pool-based swimming and racing should promote good technique, which invariably delivers a symmetrical and balanced stroke. Symmetry and balance are key to swimming straight. If an inefficient stroke, poor navigation or a wayward draft allows the addition of just 5-percent to race day distance, then the 100m repeat times you need to hold reduce from 95 seconds to 90 seconds. In terms of repeating times in the pool for 100m these five seconds mark a huge shift, possibly taking you into a new HR zone, take you above your race cruise speed and ruin your race plan. Streamline and improved technique are critical. The legs need to create as little drag as possible for the arms to pull the smallest possible vessel through the water. This concept keeps the energy and oxygen requirements to a minimum, making the chance of holding 1.05-meters per second for 2.4 miles far more likely. Fitness goes hand in hand with swim technique, and I find it hard to ignore one over the over within our sessions. Technical endurance means we cover between 3 and 4.5kms in a session with lots of swim technique reminders punctuating mid-to long-distance training repeats. You need the endurance to allow the same movements to be repeated over and over for your sub-hour IRONMAN swim. If there is one area that could be improved in terms of pure strength it would probably be the triceps area. Tricep fatigue can cause the stroke the shorten, which opens the window for the breath to shorten as well. As a result, movements become more hurried and the need for oxygen increases as streamline and technique break down. I talk to swimmers about considering the number of sessions per month they are doing rather than per week. Four sessions per week is an admirable aim and it may happen, but 14 sessions per month is a challenging but more flexible goal. At this point technique becomes ingrained in the subconscious, allowing you to focus on race tactics, pacing and positioning. Your stroke needs to become sustainable, i.e. the mechanics of your technique alone should not be tiring you out. You will need a lot of good practice to get your swimming to this level. Monthly assessments are essential to let you know how you are progressing. They help build confidence, while also giving you enough time to turn things around if things aren’t moving in the right direction. After all, it’s better to find out four months in advance that you are 10 minutes off pace from where you wanted to be rather than on race day. Start an overall watch to record the set duration. 4X50m strong steady pace – rest 5 seconds in between every 50. Stop your watch at the conclusion of the last 50. Because the rest period is kept low, it is hard to recover fully, however the frequent breaks allow a possible race-pace attempt. This workout is ideally done in a 50m pool with no wetsuit for a true and fair evaluation. On various training camps we have seen accurate predictions come from this swim for those needing to know their current IRONMAN swim ability. This simple ladder set is a key workout for IRONMAN swim pacing because we escalate distance while remaining at a constant short rest period. The lack of rest even as the distance increases is what will make this workout challenging. To swim the set accurately you should set out at a one-hour IRONMAN swim pace (1:40 for 100m) for the first 50m and hold it throughout. You are trying to hold these times quite relaxed, which might be easy at first but will likely start to breakdown at the 250m set. Treat this as a benchmark set to be repeated every six to eight weeks. When my swimmers hit six minutes on the final 400m after working quite hard for the first 1,400m then I am quietly confident they will break one hour in their IRONMAN swim. Swimming in open water for an hour is a long time to not be fully comfortable. The smallest irritant is going to feel like torture halfway through your swim if something at the neck is rubbing you. Alternatively, many swimmers add a wetsuit and suddenly feel so great in the water they think their fitness alone could power them through 2.4 miles. Wetsuits can really speed up your swim, but you need to maintain your focus on efficiency. Keep the leg kick to a minimum and keep your stroke rate sensible. Keep in mind a wetsuit will not cure a bad leg kick. All the wetsuit does is lift the leg higher up in the water so you feel like you aren’t working as hard. Wetsuits will elevate your body position in the water, but poor mechanics will still create drag. Drag is still your main enemy as it increases your breathing rate and saps your energy quickly. As a result, you exit the water tired before you’ve even started the bike leg. In truth, the fastest wetsuit is the one that is most comfortable for you. If nothing in the suit is irritating and nothing is adversely affecting the mechanics of your stroke, then you should be at your fastest. Being in the right frame of mind on race day comes from the confidence of knowing you have done your training. You should be confident about swimming the distance easily using good technique. As a result, you know you will get on your bike without feeling overly stressed or tired. More confidence means you can start farther up the field, allowing yourself the opportunity to swim the first 400m rather then battle it out mid-pack. Nothing slows a swim or leaves you as fatigued and frustrated as wrestling your way through a densely packed field of swimmers. Many swimmers find their form halfway through a swim training session after a good warm-up and a chance to build into their stroke. Try to recreate this feel earlier in the race by performing a dry land warm up ahead of a short water-based one (if possible). This way you will feel good and ready to swim well when the gun goes off. Remember that during your swim, just like during the bike and run, there will be good and bad sections. During the bad moments perform a freestyle diagnostic to check key aspects of your stroke. Stay calm and hold it together—resist fighting the swim. Refocus on your technique and your speed should come back (even if your heart rate lowers for a bit). I have deliberately omitted drafting in this section. While if done well it can help, if done incorrectly it can be fraught with issues. Nothing is more frustrating than getting an easy draft for your swim, only to learn you were drafting off someone doing a 65-minute swim when you had trained to be under an hour. This happened to one of my regular swimmers (much to his frustration) and left him in a bad frame of mind as he started his bike ride. Key areas to look at in order to give you the best chance of swimming a sub-hour IRONMAN swim are your technique and fitness. You need to be doing the kind of sets that will allow you to swim the right speed for the distance. 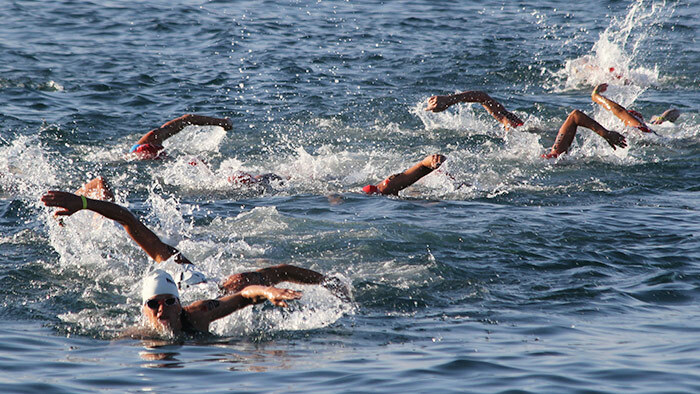 You also need the ability to swim as accurately and as close to the race course distance as possible. Additionally, you should feel very comfortable in your wetsuit and start in a position that will allow you to be competitive. Maintaining a strong but even pace will help once the excitement of the race start fades. Don’t fight your suit and make use of drafting only if you know it is going to be effective for your personal swim pace goals. A respected figure in the swimming community, Dan is a Speedo Coaching Advisor, Vasa Coaching Advisor, and a coach with the London Disability Swimming Club. The founder of Swim For Tri, Dan regularly contributes to Tri247.com, H2Open magazine and was the H2Open Coach of the Year 2004 and runner up Coach of the Year 2016.